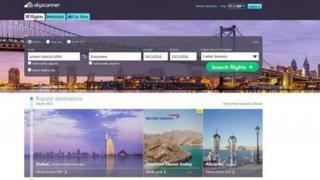 Skyscanner takeover: Good or bad news? A young Scottish company is bought by a bigger Chinese rival for £1.4bn. Is this good news or bad news? Is it another vote of confidence in a UK "open for business"? Or is it a crying shame to see another of the crown jewels of UK technology sold to a foreign acquirer? Earlier this year, Skyscanner successfully raised £120m from investors to fund expansion and acquisitions - and yet it finds itself being acquired. Just yesterday the chancellor proudly announced a £400m fund to help small companies grow into the giants of tomorrow, rather than selling up to the first foreign rival who writes a big enough cheque. It's not the first time such deals have provoked mixed feelings. Previous ministers have shown concern when important British companies fell into foreign hands. Sir Vince Cable, when Business Secretary, wanted to make it more difficult by imposing a "national interest" test and seek commitments to preserve jobs and investment after Kraft cut jobs following its acquisition of Cadbury and Pfizer threatened to swallow AstraZeneca. The truth is that Skyscanner doesn't really fit into either of these categories. The chancellor's new fund is for small companies that sell up because they find it hard to raise money - Skyscanner didn't. It's also quite a stretch to describe a travel website with 500 UK employees as a company that would trigger a national interest veto - even if one existed. This government might want to take a more interventionist role in business, but unless it wants to actually legislate against foreign takeovers (an unthinkable move for a free market conservative party) it will have to accept that deals like this prove that "open for business" also means "up for sale".